General goal of this exercise is to use non formal methods to develop an open discussion among participants, in a safe environment of simulation/role game that can generate reflections of their future actions. By using this tool, the main emphasizes are on increasing the awarness of freedom of speecg, respect of the other's opinions, critical thinking, and "standing in the other's shoes". Speaker's Corner tool is organized in two versions of the game: Classic and Debate version. The activity must be prepared with the Speakers a few days before the exercise date. In Classis version, if the topic of the speech will not be too complicated, the facilitator can choose soembody of the participants to speak. 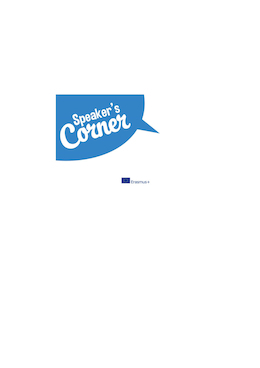 In the case of the Classic version of Speaker's Corner, they will have to prepare a short speech about a topic of their preference, including opinions and deepening the topic. In the case of Speaker's Corner version "Debate", the activity of preparation must be managed between the two speakers, as in the exercise they will be in debate between each other, with divergent or completely opponent opinions. The day of the exercise, the room will be set according to the chosen version of the exercise: in the case of Speaker's Corner "Classic", you will define a spot from which the Speaker can deliver the speech to the audience, whille in the "Debate" version, the activity will be run in circle and the speakers will be sitting with other participants. The participants are introduced to the meaning of all cards (action cards, to express opinions without words or to ask to intervene; role cards, with which they can get into a role and react accordingly; "secret mission" cards, with an individual goal to reach during the activity) and to the interaction ways. The Speakers are invited to join and the activity can begin. For the "Classic" version there can be up to 2-3 short sessions, in which the speaker talks to the audience, who can interact with action cards and the request to intervene. Each session can last up to 15 minutes, For the "Debate" version, there is one only session, set up by the two contestant speakers. The debate can last as much as the group wants, but we do suggest not to overcome 45-60 minutes, in particular with large groups. After the speaking sessions, there is a moment of short break, in which collecting role cards and give the chance to participants to "get out" of the role. A debriefing phase follows what the group just experienced, analysing the emotions and reflections that come out of the exercise. The debate continues as individuals, not anymore in the roles attributed/played in the excercise, but still maintaining the dynamics created of mutual respect of timing for speaking and the reaction to what has been expressed by other participants, through the maintaining of action cards' use. This phase can last up to 60 minutes, if the group is very large. The exercise has proven itself to be very useful to stimulate the reflection and debate on not so daily topics and/or topics usually faced in a very superficial way. Debate dynamics, whenever conflicting, become more careful and respectful and you listen more carefully the opinion expressed by the other, even when you want to contrast it.The group reaches its own balance so that inside of the activity, but also when it comes to an end, participants continue to respect time of intervention of others and let them finish their speech. In frequent occasions of use during international youth mobility projects, the exercise allowed to set a behavioural precedent, enough to orient and influence the following sessions of reflection and sharing of ideas and opinions. The target groups for the first version are youngsters older than 8yo (10-60 participants). Second version can be used with youngsters of 13yo and older (7-26 participants).